civilization: that is, cultures based on writing and the urban life. Tylor, Edward B. 1970. Anahuac: or, Mexico and the Mexicans,: Ancient and modern. Bergman Publishers. Tylor, Edward B. 1867. On the game of patolli in ancient Mexico, and its probably Asiatic origin. Bobbs-Merrill. Tylor, Edward B. 1872. The philology of slang. Macmillan. Tylor, Edward B. 1921. Anthropology: An introduction to the study of man and civilization. D. Appleton and Co.
Tylor, Edward B. 1889. On a method of investigating the development of institutions: Applied to laws of marriage and descent. Harrison & Sons. Lowie, Robert H. 1917. "Edward B. Tylor" American Anthropologist, 19, 262-268. Marett, R. R 1936. Tylor (Modern sociologists). New York: John Wiley and Sons, Inc.
Saler, Benson. 1997. 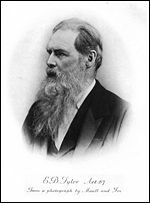 E. B. Tylor and the Anthropology of Religion Marburg Journal of Religion, 2, 1. History of "Edward Burnett Tylor"
This page was last modified on 4 April 2008, at 02:06.